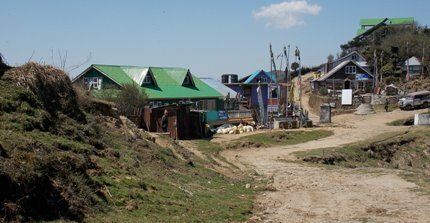 Tumling is a tiny village or a hamlet in the eastern Himalayas, located at an altitude of 9,600ft and on the way to the popular trekkers' destination Sandakphu. From Manebhanjan where the trek or the Jeep safari starts, Tumling is at a distance of about 13kms and takes about 1hr 45 minutes by 4-wheel drive vehicle (usually old British Landrovers). Manebhanjan is 1hr 15min drive from Darjeeling. As you approach Tumling, you will notice small cottages and huts from a distance. There are probably only 10 to 12 Nepali families who live here. 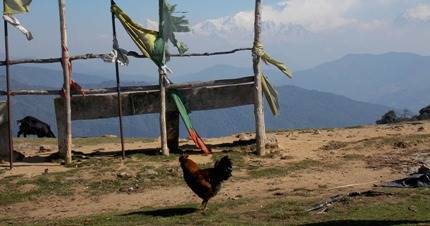 There are also few private lodges and huts that have come up here to cater to tourists & trekkers heading towards Sandakphu. Right at the center of Tumling, there is a lovely view point which is more like an open field. From the edge of this area you get magnificent views of the Kanchenjunga snow peaks. On the far left is the Sandakphu peak. There is a signboard here pointing towards the Singalila National Park ahead. Entry to the park is about 1km from Tumling. Tumling actually is part of Nepal although there is no restriction to visit the place for Indians or even foreigners with Indian visa. In fact the border between India and Nepal in this part is quite blurred and it's kind of a free way for all. You won't know when you are crossing the border. During winter (December through February) there can be heavy snowing in Tumling and it gets covered with thick snow. 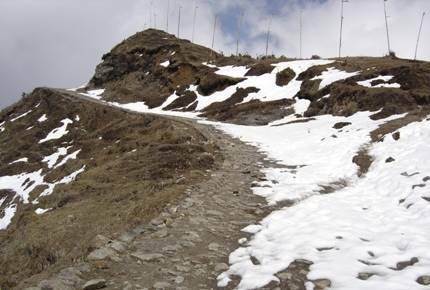 While trekking is possible during winter (requires adequate trekking & snow gears), vehicles may not be able to ply beyond Tumling as the roads can get blocked. The viewing area in Tumling is just a small elevated land with couple of concrete benches which have not been maintained for years. Often cattle like cows, ships etc are left loose by the villages for grazing. Sometimes several goats or even roosters would be sitting on the benches instead of human beings. But on a clear day the view around is awesome. Kanchenjunga snow peaks appear to be at a stone's throw distance. Many Buddhist prayer flags are hoisted at the viewing area that flutter in passing breeze. The locals believe that fluttering of the prayer flags brings in purity and holiness to the area. During peak winter the view area gets completely snow covered. Close to the viewing area you will see the trekking trail of Tonglu coming from a higher altitude and merging at Tumling. This gravel road is used both by trekkers and 4-wheel drive vehicles. Several private accommodations are available in Tumling. Shikhar Lodge, a nice but basic lodge is owned by Neela Gurung, a Nepali woman. This lodge is the first one visible as you approach Tumling from Meghma or Tonglu. It has cottages with pink tinned roofs and surrounded by majestic mountain landscapes. Some of the other well known accommodations here include Hotel Siddhartha and adjacent to it Mountain Lodge, both of which are located close by and facing the viewing area. During the peak season (March - April, and October - November), there is heavy demand for these lodges. Many tourists visiting the Singalila National Park come and stay here overnight and enjoy the scenery around. Earlier there was no electricity in Tumling and most lodges used solar powered lights for limited time during night and would offer hot water in buckets which they warm up in kitchen. Update April 2016: There is now electricity available in Tumling. Although water is available, hot water is still supplied in buckets. Most lodges continue to use solar lights as electricity is unreliable and often there are prolonged power cuts. Only Vodafone mobile network and BSNL work at Tumling in patches and that too at some specific spots. There are couple of small stores at the main village area selling packaged water, snacks, dry food, biscuits and even alcohol (unlicensed). In fact almost all hotels and lodges here can offer beer and spirits. Some lodges like Hotel Siddhartha make local rice beer (called Chhaang in Nepali) and offer it in large aluminum container with a straw. Now Siddhartha Lodge and Sikhar Lodge, Tumling provide solar electricity from dusk to around 10PM. Mobile and cameras can be recharged during this period. We have just returned to the UK from our family holiday in northern India and all agree that the 2 nights we spent at Shikar Lodge was the highlight. Neela greeted us so warmly and looked after us with hot water bottles (April so chilly nights) and delicious food. I can't remember the name of the bread we had for breakfast but it was yummy! Sitting around the fire drinking millet beer and chatting to other travellers was very memorable. The surrounding landscape was spectacular. Despite some fog we were rewarded with a clear early morning view of Kanchenjunga which was quite amazing. The rhododendrons were also quite stunning although we were a little early so plan to return in May next time. We even have happy memories of the cockerel loudly announcing his presence at 5am, although I don't think we were quite so happy at the time! Raj, disturbing you once again. I along with 5 more men & 5 women and 5 children want to visit Tumling in October 19 to 23. As I learned from your article there is no electricity in Tumling, is the evening and night are enjoyable in Tumling? Especially for childrens? Is it better to stay for 2 night in Tumling & stay another 2-3 nights in nearby another village which have electricity? If so what should be our next stop? Actually we are comffortable in Risyap-Loleygaon like destinations. Rishyap, Loleygaon are proper tourist places having hotels with standard amenities. Tumling is not a family vacation place. It's a trekkers place. You should choose Tumling only if you like raw nature, there is nothing else. Hotels are very basic and there won't be any entertainment for kids. 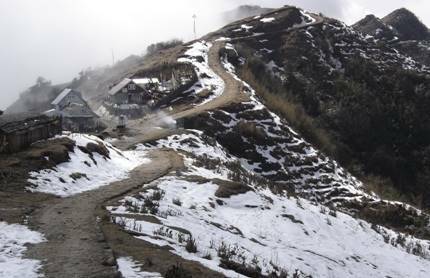 From your query, it looks like you all would be more comfortable with a standard tourist place like Mirik/Jorpokhri. You can even try Chota Mangwa. You will find details of these places in my site.